I began our Low, Slow and So Worth It series by compiling recipes and techniques. First, came the braises and stews. Then I began to ponder veggies recipes. Last I realized that desserts shouldn't get overlooked either! I decided on a cutting off point to define what low was..and slow was. This recipe - well, it didn't really fit. You see, there's no way to claim that 400 is low. And, at 40 minutes, I wasn't gonna say is was slow, either. Till a friend explained that if you don't cook everyday... waiting 40 minutes for veggies is INDEED slow. So this is a (not so) low and (yet, apparently) slow method of making scrumptious veggies. How scrumptious? Well, my hubby gobbled 'em up and asked what they were called. He figured something that tasty would have a fancy name. Nope. Just lots of love. See that long slice in the photo that looks a bit like jicima? It's broccoli stem. Each week my pal Sergio used to make salads next to where I made the homemade pizza dough. And, as a "chef's treat" he would save the broccoli stem to share with us. We'd eat it raw and it was darn tasty. A bit like if broccoli and cauliflower had a love child. He asked me what to call it and I came up with "Broccoli Heart." Since he handed it out with love to us each time, I felt it was appropriate. Good guy, Sergio. This was inspired by my pal Lisa at The Cutting Edge of Ordinary and Ina Garten. Preheat oven to 400 degrees. 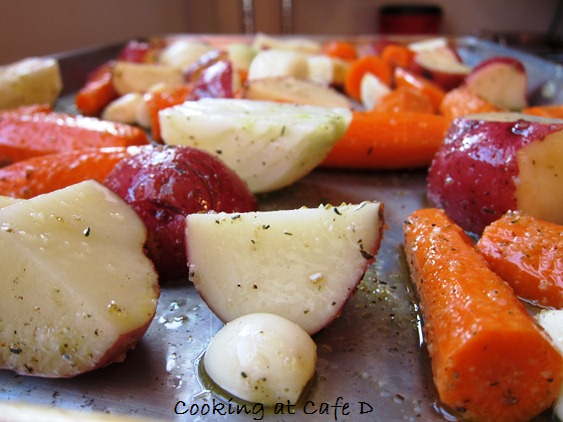 Toss veggies (except the broccoli) in olive oil, salt and pepper and spread them out on a sheet pan. Add rosemary or other herbs, as desired. Place in the pre-heated oven and set the timer for 15 minutes. Meanwhile, cut the broccoli into florets. 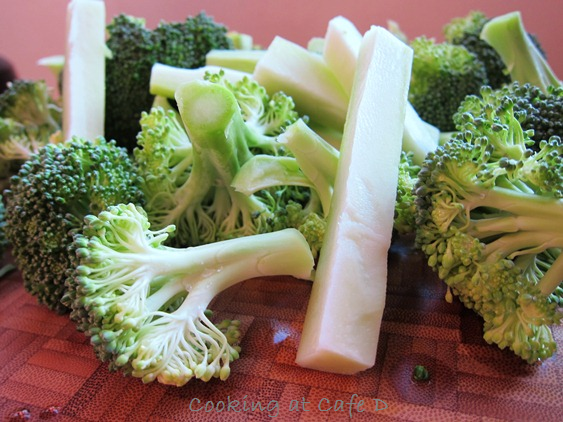 Peel then slice the broccoli stem into sticks. When the veggies have roasted for 15 minutes, remove them from the oven, add the broccoli and carefully toss them together. Return the pan to the oven and roast for another 25 minutes or so. Check periodically since oven temperatures vary. When the potatoes are fork tender, remove the veggies. Move the vegetables to a platter so they will not overcook on the hot pan. 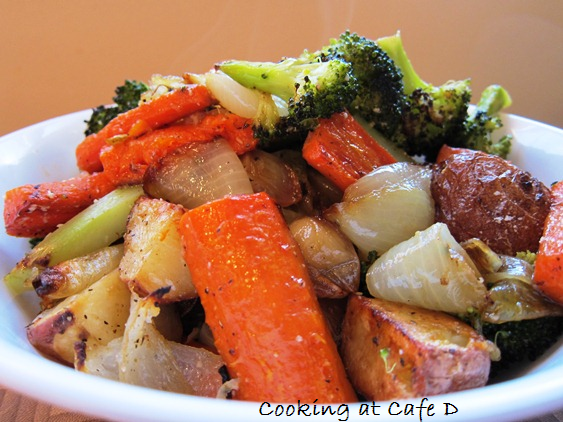 What is your favorite roasted vegetable?